Whilst at risk of sounding like a broken record, the past few weeks have passed by in an absolute blur. During the past month we've had a house move, spending quality time with our wonderful family visiting from Oz for 2 weeks, Christmas itself, and visits from two sets of Welly friends. Yeah nothing much going on at all!!!!!! But I better back the truck up because before all that there was school finishing up for the year, prize givings, hip hop dance recitals, a bike ride on the new Expressway before it opened and a day watching the World Track Cycling Champs. We do like to keep ourselves busy don't we?! First up was Noah's hip hop dance recital - he only decided to join hip hop classes this term as one of his best friends is also in the class. They practiced every week and at the end of the year performed Macklemore 'The City Can't Hold Us'. Noah was amped for the concert, much more than we were when we found out we would have to sit through 2.5 hours of other performers first - now I understand the pain of all those ballet mamas who have to sit through hours of other grades and classes just to watch their own child perform! Boy this boy is growing up! The next day we headed off to the Velodrome for a day watching the World Track Cycling Champs. We'd been to the Velodrome plenty of times before but had never seen athletes competing with such intensity. As we entered the complex, a cyclist zoomed past right at crazy speeds of up to 70 km/hr. There was a great atmosphere any time the Kiwis raced and we cheered along with the rest of the crowd. What I hadn't appreciated is that track cycling is made up of a whole lot of different disciplines, some odder than other - have you ever seen the Keirin race where they follow a motorbike for 3 laps before a 3 lap sprint to the finish? Or the Madison where they sling each other forwards like they're passing a baton? Or the Omnium which is like a Decathlon for cycling? It was awesome seeing all the cyclists from a huge variety of country groups getting warmed up and warmed down in the centre of the track. During one of many breaks to get some fresh air outside (it was warm inside - they keep it at an optimum 28 degrees for the cyclists!) the boys enjoyed a ride on the outdoor bike trainer which involved enough revolutions to turn a blender mixture into a smoothie which they then got to enjoy afterwards. The following week was school prizegiving - we hadn't experienced a whole school prizegiving before - it wasn't something our school back in Wellington ever did. It was a very cool night seeing achievement being recognised - both at a sporting and academic level. 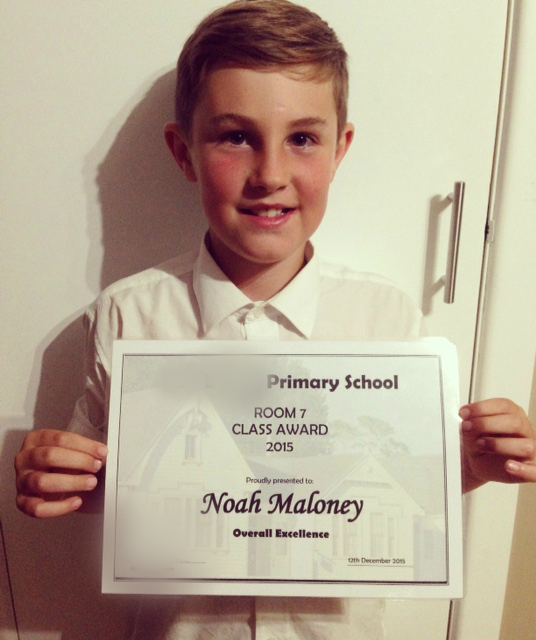 And to our great surprise Noah received a Class Excellence award (one of three in his class to do so), made even more surprising as we were only here for the second half of the year. The following week school broke up - the same day the new Waikato Expressway was open to the public for the afternoon/evening. We ummed and ahhed about going along - only a week till our house move and still so much to do - but in the end decided it was one of those once in a lifetime opportunities so we just had to seize the moment! We biked 5km south along the Expressway to the new Karapiro viaduct along with hundreds if not thousands of other walkers, runners and cyclists. On the other side of the road, those who couldn't (or didn't want to) walk took buses on the same journey that we biked. The viaduct is most impressive in its height - at 40 metres it's only 3 metres lower than the Auckland Harbour bridge. What's even more impressive is that this whole part of the Expressway was built under budget and ahead of time - something touted far and wide the following day at the official opening. It's great riding on the new Expressway - even though we don't drive on the new section every day, the daily journey to Hamilton is so much better now that both lanes are open and the speed limit is 100 km/hr.